Athens Olympic stadium is an important venue for various sports events that mark the city. Named after the first modern Olympic marathon race winner Spiros Louis, this stadium is today host to one of the biggest sport clubs in Greece i.e AEK Athens. Almost each one of us knows how important Olympics is to the history of Greece. A practice that started in 11th century B.C still carries that importance in the tradition of Greek society. Originally built in the early 1980s for the European Olympic Championships, this stadium was later on redesigned by famous architect Santiago Calatrava for 2004 Olympics. Even though you are not able to watch a match here, do visit this site as a part of a guided tour. The Athens Olympic Stadium or The Olympic Stadium of Athens opened in 1982 and is a part of the Athens Olympic Sports Complex. One year after its opening, the Athens Olympic Stadium hosted the European Cup final and since then have been a venue to many sporting and cultural events. The stadium has a capacity of almost 70000 guests and features a curved roof design. The stadium organises many guided tours and also has a small museum that houses the Olympic torches. Audio-guided tours are included in the ticket. The audio guide tour is available in 10 languages (Greek, English, French, German, Spanish, Italian, Russian, Chinese, Japanese and Portuguese). Check official site for event times. How popular is Athens Olympic Stadium? People normally club together Attica Zoological Park and Herakleidon Art Museum while planning their visit to Athens Olympic Stadium. Shame to see such a excellent Calatrava building degrading so much! 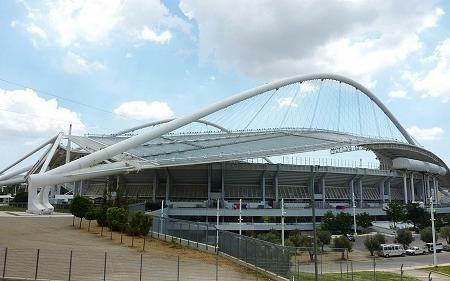 One of the most modern and the biggest sports stadium in Greece. It was built to host the Olympic Games in Athens 2004. It has a capacity of 60000. Good access and parking facilities are provided only if you arrive early prior to an athletic event. Especially for football parking can be troublesome, so be warned. The facilities remain open for the crowd and anyone who may wish to use the surrounding park for running. 15 minutes from the center of Athens, a nice place to visit, still in use for some sporting events. Panathinaikos BC qualified to the playoffs of euroleague! !